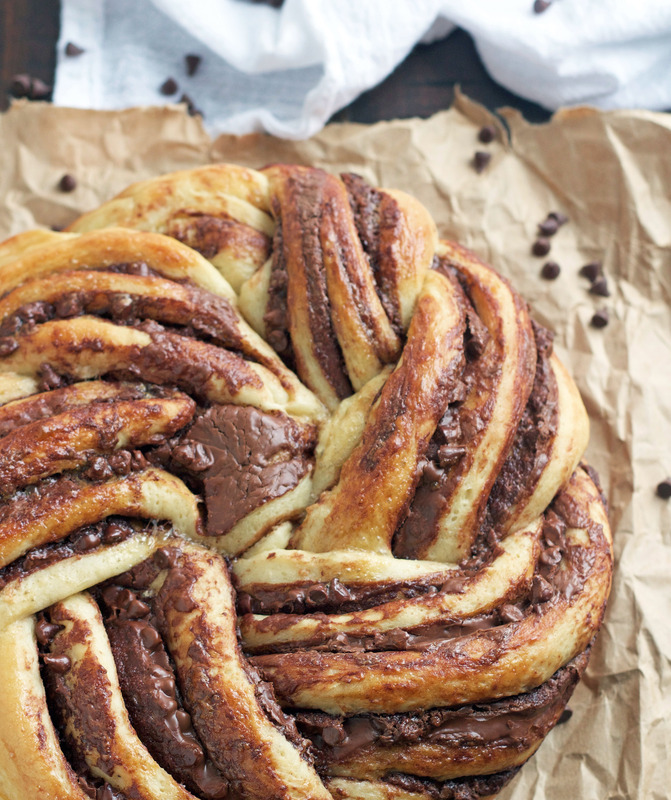 This Nutella Chocolate Chip Braid is a sweet tender dough with swirls of Nutella throughout. It’s absolutely gorgeous to look at and absolutely delicious to eat! I know I’ve mentioned it several times before but I am a huge bread lover! Actually, we are all huge bread lovers at our house. We are also a Nutella-loving household. Well, everyone except Zach, he could take it or leave it. I keep telling him he’s missing out, but he’s still not sold on the stuff. 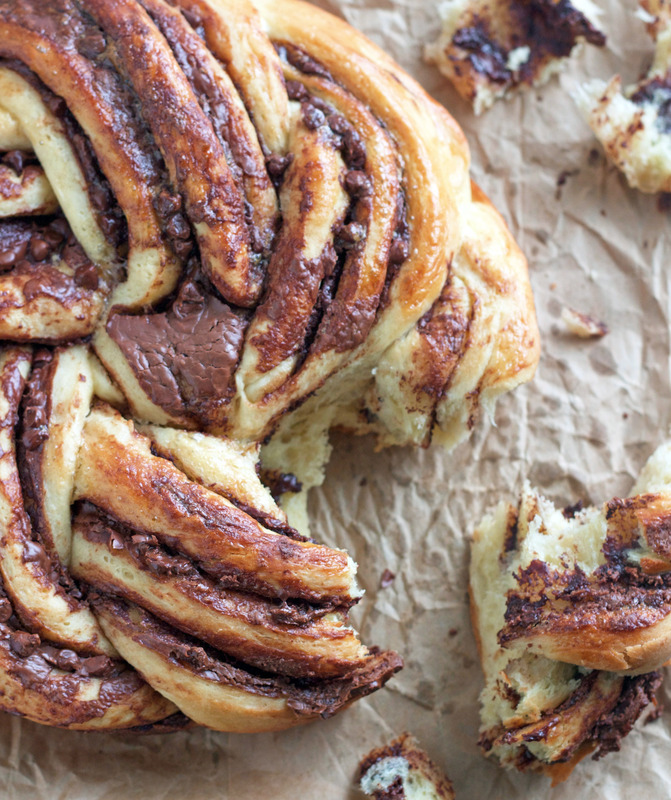 Well for the rest of us, I knew I had to make this Nutella Braid as soon as I saw the recipe. So I did and it’s absolutely delicious. I know it looks like it’s complicated to make, but it’s not, I promise. 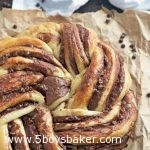 I forgot to take step-by-step pictures of how to cut, braid and roll this bread, but you do it the same way you make this cinnamon swirl bread. If you’re a visual person like I am, and need to see pictures, you can click to see that post. Oh yeah, one more thing we spread some homemade raspberry jam on this and it was just ridiculously good! The original recipe called for 1/2 cup of finely chopped toasted hazelnuts, so if you want to use those instead of mini chocolate chips, go right ahead. You could actually do both and it would be delicious! In the bowl of a stand mixer combine warm milk, sugar, and yeast. Let stand until mixture is foamy, about 10 minutes. Spray a large bowl with cooking spray. Place dough in bowl, turning to grease top. Loosely cover and let rise until doubled in size, about 1 hour. Spray a 9-inch round cake pan or skillet with cooking spray. Roll dough into a 16x14-inch rectangle. Spread chocolate-hazelnut spread onto dough, leaving about a ½-inch border on all sides. Sprinkle with chocolate chips. Starting with one long side, roll jelly-roll style, and pinch edges to seal. Place dough, seam side down, on a cutting board, and cut in half lengthwise. Carefully twist dough pieces around each other, and then form into a circle. Place in prepared pan, cut sides up. Cover and let rise until doubled in size, about 45 minutes. Brush with beaten egg and bake until golden brown, about 45 minutes to 1 hour, covering with foil halfway through baking time if it begins to get too brown.